The Lite-On eUAU108 is being touted as the world's slimmest optical drive. 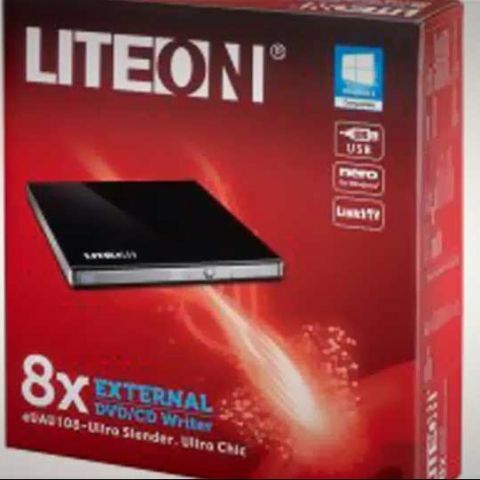 According to Lite-On, the drive is about 6% slimmer than the other slim drives available in the market. Taiwan-based optical storage solutions service provider, Lite-On, has launched the 'eUAU108' external CD-DVD drive in India. Touted as the world's slimmest portable optical drive, the Lite-On eUAU108 measures 13.2 mm height and weighs under 250 grams, which makes it about 29% slimmer and 16% lighter than Lite-On’s own ultra light predecessors and about 6% slimmer than the other slim drives available in the market, says the company. The Lite-On eUAU108 comes with Link2TV feature that enables TV’s USB port to allow the TV’s media player to access music, video, or pictures stored on disc. The eUAU108 supports plug and play, and is compatible with major OS such as Windows 8, Windows 7, Vista, XP, Linux, and MAC OS. The drive has a Smart Burn Technology, which supposedly helps rapidly adjusts writing method and power level to write disc with the highest writing quality and prevents buffer underrun errors. The external DVD drive can read and write files at a variety of speeds across different data media types including: 24X CD-ROM, 24X CD-RW, 24X CD-R, 8X DVD±R recording, 5X DVD-RAM recording, 8X DVD-ROM recording, 6X DVD R Dual Layer recording, 6X DVD-R Dual Layer recording, 8X DVD RW recording and 6X DVD-RW recording. The Lite-On eUAU108 is available at an MRP of Rs. 2,700.